Improved handling of licensing issues. 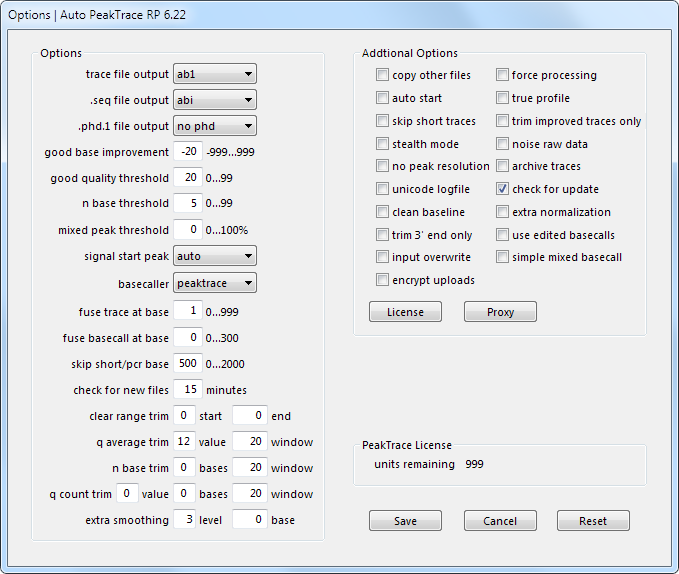 Auto PeakTrace RP 6.21 has been released. This is update improves the reliability and speed of PeakTrace RP processing. New Feature. Additional Australian and Chinese based RP server. More accurate estimated time to completion function. Improved handling of proxy server issues. New Feature. Regional based servers to improve processing speed. Use of the new servers may require a new license code. New Feature. User control over file upload encryption. Turning off encryption can speed the upload speed. Dynamic speed adjustment to match upload speed with network speed. This should result in much faster trace processing on fast networks. Bug fixes and internal improvements to improve robustness. Just a quick update on how Auto PeakTrace RP charges for traces processed. Officially it has always been that if you set the good base improvement to value great than −10 (i.e −9 and higher) then you would be charged for traces that are not improved by PeakTrace. This rule was to stop the abuse of the PeakTrace server, as well as to encourage users to set sensible values (the default −20 is best). Setting the good base improvement to value higher than −10 is far from optimal. We have until now not enforced this rule, but unfortunately some people have not used this freedom sensibly and so we have reluctantly started enforcing this rule. If you have been using a good base improvement value of greater than −10 then we highly recommend setting it back to a value below this (i.e. the default −20 is best). One final tip. If you are having problems entering a negative number in the good base improvement box you can do it by pressing the reset button on the options window and then modifying the number, or by copy and pasting in the negative value from a text document. We will be making it easier to enter a negative number for this value in the next release. 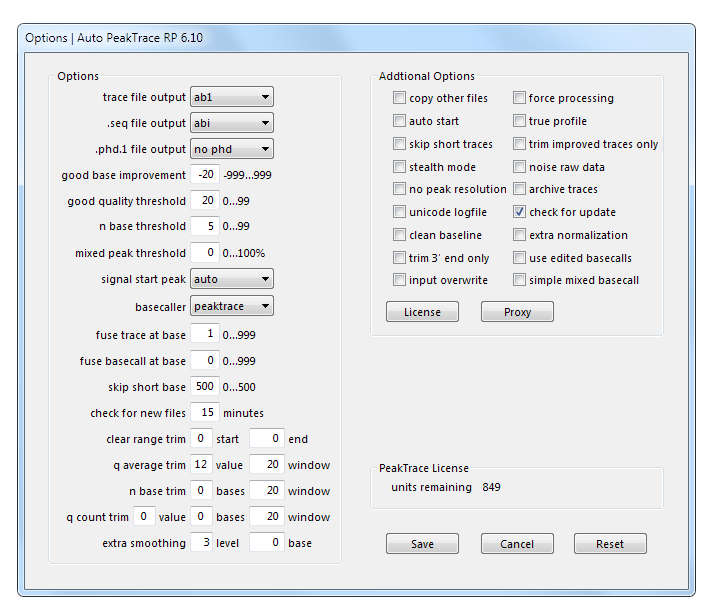 Auto PeakTrace RP Options Window. We have released Auto PeakTrace RP 6.10. This is a major update to our PeakTrace RP software and offers a number of improvement and new features that have resulted from our customer’s suggestions as well as the usual bug fixes. The full list of changes are. New Feature. Limit trimming to the 3′ end of the trace only. New Feature. Set the output to overwrite the input traces. New Feature. PeakTrace basecalling with KB fall back. A reorganized and simplified Options window. I will be writing posts on the new features over the coming weeks as they provide some very interesting and useful features. This major update is available from the Nucleics Downloads page and it is highly recommend that all users of PeakTrace RP upgrade to this version.